Ronnie O'Sullivan has backtracked after claiming Stephen Lee is not the only player guilty of match-fixing, saying his words were "taken out of context". The world champion, 37, tweeted the allegations after Lee was found guilty of fixing seven games in 2008 and 2009. World Snooker boss Barry Hearn called O'Sullivan's comments "unacceptable and damaging" and asked for an explanation. 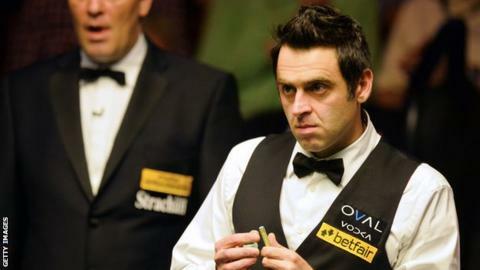 O'Sullivan stated: "I was referring to rumours from years ago when there were only a few tournaments on the circuit." He added: "The comments were an instant reaction to an issue which I feel strongly about, namely the integrity of my sport. "I have no intention of undermining the integrity of the sport that I love and enjoy participating in so much and firmly believe that my tweets were taken out of context. 2008 Malta Cup: Conspired to lose to Ken Doherty and Marco Fu, while conspired to lose to Neil Robertson by a pre-determined score, with the match ending 5-1 to Robertson. 2008 UK Championship: Agreed to lose the first frame in matches against Stephen Hendry and Mark King. 2009 China Open: To lose to Mark Selby by a set score, Selby winning 5-1. 2009 World Championship: That Ryan Day would win by a pre-arranged score, Day winning 10-4. "The snooker circuit calendar is now full of tournaments all year round and has undoubtedly been cleaned up since World Snooker was taken over by Barry Hearn. "I do not want my comments to leave a damaging mark on the game." O'Sullivan commended World Snooker for their action on Lee, and said he was aware of his obligation to report any knowledge of match-fixing. Following Monday's verdict on Lee, which found the former world number five guilty of fixing matches, O'Sullivan tweeted: "I've heard there's many more players who throw snooker matches. "I suppose Steve Lee was just caught out. "No need to worry if you got nothing to hide. But plenty of people have got loads to hide. That's why there is no free speech. They're hiding. "They will prob (sic) fine me for talking about it. They don't like you doing that. Like to keep things under the carpet." O'Sullivan later added he had "no concrete evidence of match fixing in snooker," but hinted players were aware of who might be involved. Lee, who denied the allegations, will find out his punishment on 24 September.